Cable Length: Approx. 25cm / 9.8"
High Quality for Marine Grade Stainless Steel Cover, highly anti-corrosion, safty guarantee. Material: Stainless Steel cover--- resist corrosion, Polycarbonate Lens; Quick and easy mounting installation. Input voltage: DC 12V; Dimensions: Base Dia 2.4inch, height 1.8inch; Radiation angle: 112.5 degree; Rating: IP67 waterproof. Perfect replacement lights for the front of the pontoon boat, meet wildlife and fisheries regulations. 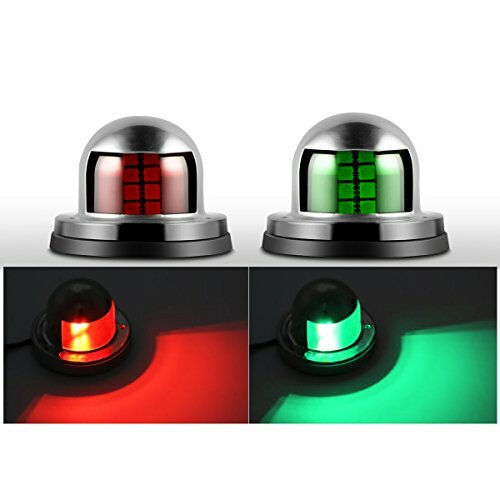 Package Included - 1 pair of Navigation Lights (green and red)--- Red for Port side and Green for Starboard side. If you have any questions about this product by Exsart, contact us by completing and submitting the form below. If you are looking for a specif part number, please include it with your message.